The historic residential district of Breckenridge sits on a slight rise on the east side of the Blue River facing the ski mountain. Just north of the district, still on this rise, is a newer neighborhood of single-family homes and a few condo complexes. Andorra Condominiums is one of these - a small, 9-unit complex – on N. French Street. From any Andorra Condo for sale, Main Street is just a block down the hill. Cross the Blue River and get on the bike/pedestrian path; the gondola is a block south, and City Market, a block north. The bike path is also part of a countywide system, which continues north to Frisco and on to Copper Mountain, Vail and Keystone Resort. Start your search for that perfect in-town condo with the Andorra condominium listings below, or learn more about this stunning complex. All of the Andorra Condos have two bedrooms and two baths, a balcony or deck, a private garage and designated parking. Homeowner association dues are moderate and include hot-water heat, gas, electricity, sewer, water, trash, cable, insurance and snow removal. The complex has a common laundry and hot tub for owners. Andorra Condominiums appeal to those who want a modest place in a quiet neighborhood, with an unbeatably convenient location. 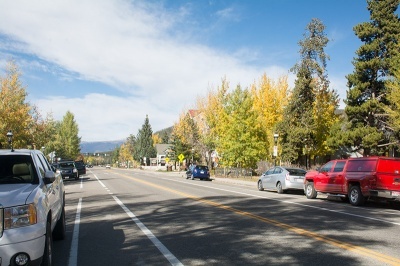 Their view is to the Breckenridge Ski Resort and Gold Creek Condos, seen in this picture, beyond which is Main Street. After Breckenridge became a ski town, a few small condo complexes were built on North Main Street, and eventually a few more developed up on French Street. Andorra Condos were built relatively late, in 1982, filling in a flat lot between at a slightly higher elevation than their neighbors to the west. 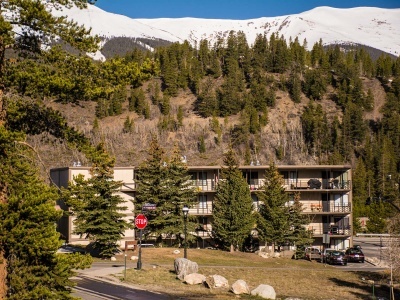 They offer a great view of Breckenridge Ski Resort and the Tenmile Range. Single-family homes and townhomes have filled in the North French area. Andorra Condos rarely come on the market. The location and small scale of the complex appeals to buyers looking for a ski-country second home or down-sizing locals. Andorra Condos are located on French Street (1.5 blocks east of Main) north of Wellington. They are directly north of the Val d’Isere Condos. Located on the North end of French Street near City Market and Main Street. Andorra Condominium was built with locals in mind. A modest floor plan, private garage and deck with a view combine for a comfy mountain home. 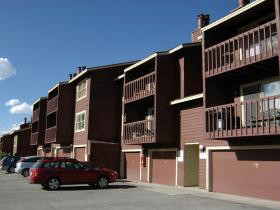 Do you have any questions about Andorra condos, or any other Breckenridge area? An expert is waiting to talk to you! Contact us now.